Domestic violence is often kept secret, but there is no secret about what Sharon Goodrich, Executive Director/CEO of Pain into Power is doing to uncover this darkness that occurs worldwide. Her goal is to educate and empower women who are caught in the web of domestic violence to find a way out. Pain into Power Inc., founded in June of 2008, is a program that encourages women in violent relationships to refocus their lives; changing the direction of their future. They offer multiple opportunities for women, including a drop-in center, eight week empowerment classes, seminars and ongoing support. “The classes and seminars offer concrete solutions that can be implemented to regain dignity by refocusing their life and energy,” Goodrich wrote in her newsletter. Her mission is to provide services to transform and renew hope to survivors, families, communities, and to hold public memorials that honor victims lost to violence. 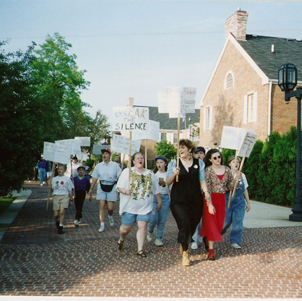 From 1995 to 1997 Goodrich was Event Coordinator for Violence Awareness Day, an event that raises awareness of violence in Cuyahoga Falls. Mayor Robart spoke at one particular event, followed by others from social service agencies and poetry readings from survivors. It included a march through downtown Cuyahoga Falls and was ended with a candlelight vigil to remember those who died as a result of violence. Goodrich, a woman with relentless passion for what she does, even traveled to the Ohio State Capital and gave a seminar on March 12th of this year. She attended the Violence against Women national event in Washington D.C. presented by the National Organization for Women as well. She isn’t stopping there. This past November she began filming a documentary on violence. She filmed in Columbus while there to speak with one of the state representatives and plans to use the interviews of the survivors in her training with the state and in her classes. “I use it (the video) to show women that there are other people who have been through what they are going through and that they can get out,” she explained. What led to the formation of this non profit was the fact that Goodrich was in a domestically violent relationship herself. Because of this she is now able to steer women away from stepping into the same relationship traps and making the same mistakes that she did. Eventually the arguing led to pushing and shoving. Her boyfriend (who eventually became her husband) also had a rottweiler that would protect him during the arguments. “The dog would attack me repeatedly,” Goodrich recalls, even having nightmares of the scenario while staying at the Battered Women’s Shelter. The police were called 9 times during only a year and a half of their marriage. At the time Goodrich didn’t have a car or job. She would often call 911. So she left him, but then came back – which was a repetitive pattern. So she would go back, but things only got worse. The next time she left and came back her husband told her that if it happened again, someone was going to die. Finally one day she left for good, taking a small bag and heading to the Battered Women’s shelter where she stayed for 6 months. She then moved to the Crisis Center where her ex was spotted driving around the property so she had to be moved again. Her ex sent her money orders for $500 each, but she wasn’t falling for it. She even mailed her phone back to him. “It was me saying ‘I don’t want to hear anything anymore’,” she said. After sending the phone back she got a Civil Protection Order. He could not come within 500 feet of her, or send her or her family and friends messages, but even with a protection order and living in a secluded shelter she didn’t feel safe. While staying at different shelters, Goodrich recalls often seeing women go back to their husbands repeatedly. “They would get hooked by phone calls,” she said. She learned a lot about herself while observing their behavior. During this time she also did a lot of research, finding statistics and how to educate women. “One in three women is a victim of violence at some point in her life,” she said. She particularly focused on statistics in Ohio, such as how many protection orders there have been, how many arrests and how many deaths and says that it is consistently going up. “It is not going down – the statistics are rising,” she said with concern. She also found that medical referrals due to abuse are approximately 7-8,000 a year, while the amount of psychological referrals due to abuse is three times higher than the medical referrals. When she left the shelter she continued to write about the topic. She eventually purchased a lap top and learned how to do power point so that she could begin helping other women. She started teaching classes and then moved into a building on the corner of Market and Buchtel, on the bus line, close to City Hospital and Community Health Center. As mentioned before, Pain into Power Inc. offers eight week, two hour long empowerment classes at the Drop in Center where women are educated on violence awareness and given the characteristics of violence. She says that it’s often not that women don’t want to get out, but that they are too exhausted to try to get out. The classes at the Drop in Center are open to women of all ages. Goodrich has had women from ages 19 to 65 come in. There will also be meetings in the conference room at the new Transit Center in downtown Akron once a month from 10:00-4:00. Dates through October include July 30th, August 20th, September 24th and October 23rd. A support group is held every Wednesday from 12:00-2:00 p.m. and Goodrich provides seminars for anyone interested. Many women have been educated and helped through this program. One woman fled her husband from Florida, leaving in the middle of the night in her pajamas and taking a bus on a ticket given to her by a friend in Akron, who she’s been living with since January. But though she escaped her husband she could not escape his calls. This is where Goodrich’s experience of what works and does not work came in. The man even had someone stage as a “nurse” and call her saying that he was dying of cancer. Goodrich used to minimize the violence in her relationship, but doesn’t want to see other women fall into the same trap. She loves seeing the women “connect the dots” as she teaches classes, gives power points and shows movies. This woman has not gone back to her husband since and is now planning to go to Massotherapy School at age 65. It helps that the women also encourage each other. If you are a church interested in having Goodrich come speak on this topic, she would love to do so. “We can use donations of all kinds,” Goodrich said, including personal items, shampoo and bus passes. “There are women who have no means of getting around,” she said. If you are a woman or know a woman who is in an abusive relationship please contact Goodrich at (330)622-0613. You can also get more information at www.painintopower.com.